Treatment of the C3KI mice. (A) Kaplan-Meier survival curve analysis showing 100% survival in C3KI animals treated with BB5.1 (n = 8), in comparison to isotype control–treated animals (n = 11). (B) Where available, plasma creatinine values were analyzed. Shown are results for 7 C3KI mice treated with BB5.1 (C3KI + BB5.1, red triangles), 8 C3KI mice treated with isotype control antibody (C3KI + isotype, blue diamonds), and 15 untreated C3KI/WT mice (black squares). (C) Platelet counts of 8 C3KI mice treated with BB5.1 and 6 C3KI mice treated with isotype control antibody. Absolute numbers were provided by use of cell count beads and flow cytometry. (D) Frozen kidney sections were collected from C3KI mice treated with BB5.1 or isotype control antibody and stained for glomerular C3 (anti-C3, upper panels, original magnification, ×20) and C9 deposition (anti-C9, lower panels, original magnification, ×10). Images are representative of 5 images per animal analyzed. (E) Top panels: PAS-stained sections from C3KI mice treated with BB5.1 and IgG control. Histology demonstrates features of a TMA. Original magnification, ×20. Representative of 8 BB5.1-treated animals and 6 IgG control-treated animals. Bottom panels: Electron microscopy images of BB5.1-treated animals and IgG control showing foot process effacement and subtle areas of subendothelial lucency. Original magnification, ×5000 (BB5.1), ×6000 (IgG). 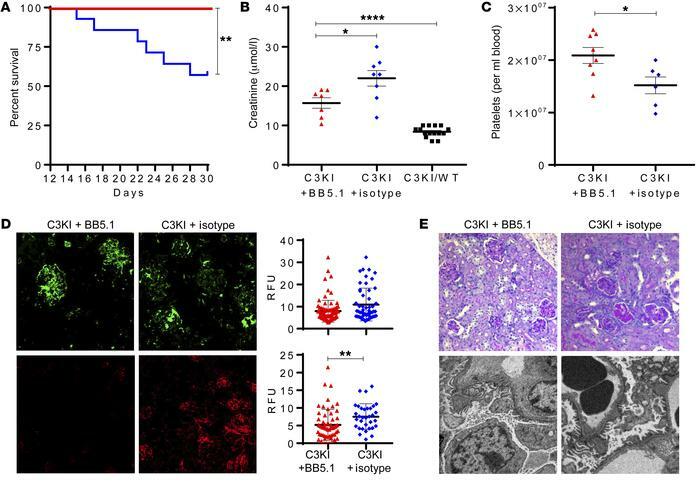 Representative of 2 C3KI BB5.1-treated and 2 C3KI IgG control–treated mice. *P < 0.05, **P < 0.005, ****P < 0.0001 using unpaired t test with Welch’s correction.